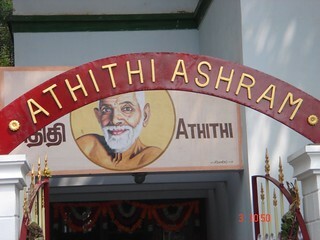 Athithi Ashram is dedicated to Bhagavan Sri Ramana Maharshi. It is Bhagavan’s gift to humanity. It was founded by Swami Hamsananda in 1992. Subsequently, Athithi Care Trust, a registered charitable trust, was formed by Swami Hamsananda along with Maathaji Sowmiya and Sri C. V. K. S. Raju as Trustees. Sri Ramaswamy Pillai, an old devotee of Bhagavan insisted Swami Hamsananda to start an Ashram for seekers and sadhus. His repeated requests and prayers to Bhagavan were instrumental in forming the Ashram. Sri Madan K. Kamat, a devotee of Bhagavan, donated land and constructed a building for sadhus and spiritual aspirants. Taking cue from him, other devotees have joined in building cottages. A group of seekers have joined hands to serve the Ashram and to help achieve its objectives. The Ashram provides accommodation and food to pilgrims and seekers. All are welcome, without the distinction of caste, creed or religion. Daily Pooja is performed with chanting of Bhagavan’s Tamil Works. Satsang sessions are conducted for seekers and guidance in meditation is also provided. The Ashram is a spiritual haven to seekers of Self Realization in the unique path of Self Enquiry as taught by Bhagavan.